The Genset Controller Be2K-PLUS is a combined 3-phase AMF ATS & Generator Control System. The parameters, the alarms and operating functions are indicated by means of a high-performance 128X64 graphic display capable of operating in between -30°C and +70°C. 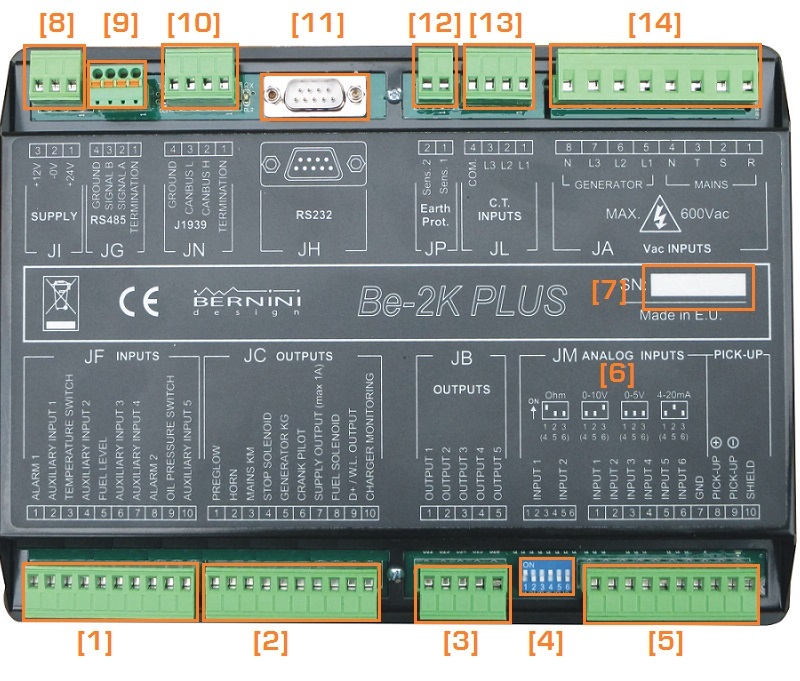 The front panel features super-bright solid state indicators able to provide a view about the status of the controller in all climatic conditions. 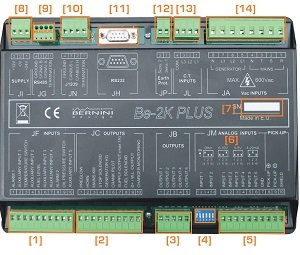 Be2K-PLUS interfaces with resistive-sensors, 4-20 mA /0-10 Transmitters and a magnetic Pick-up (or 'W'). Measurements including Vac, Aac, Vdc, kVA, kVar, kW, Energy, Pf, Hz, hour count, R.p.m., Oil Pressure, Engine Temperature, 3 Auxiliary Temperatures , Telecom Battery Vdc , Battery Vdc (Engine) and Fuel Level. 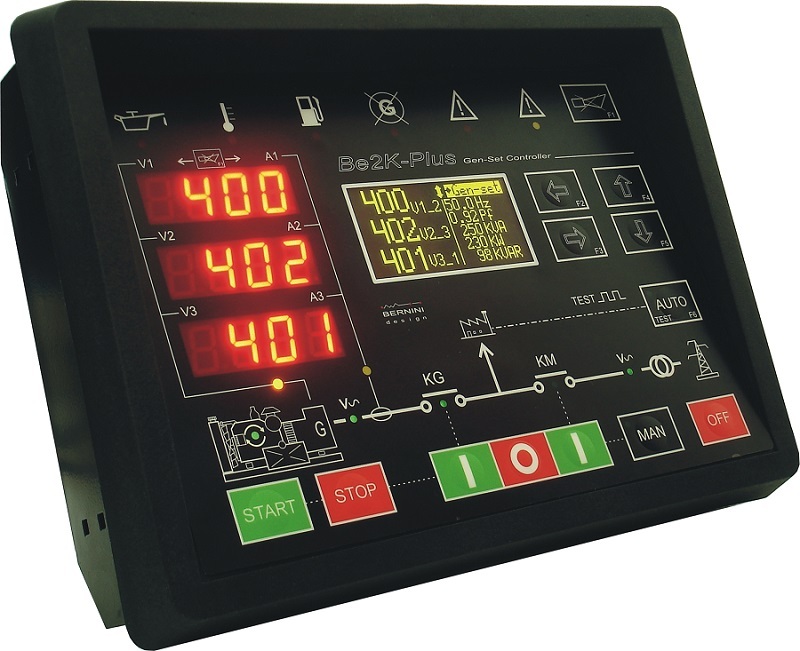 The Be2K-PLUS is SAE-J1939 compatible and provides RS485 and RS232 interfaces. Be2k-Plus interfaces with GSM modem and complies with NFPA-110 / NFPA-99 specifications. Connectivity to Internet is provided through the Bernini Design TCP-IP Server. The Genset Controller Be2K-PLUS is designed for generating set installed in antenna stations and telecom applications. LESSONS OF FULL IMMERSION IN THE AUTOMATIC MAINS FAILURE CONTROL PANEL MATTER. HOW TO DIMENSION A PANEL, HOW TO MANUFACTURE PANELS, HOW TO INTERFACE A PANEL WITH A DIESEL GENERATORS. 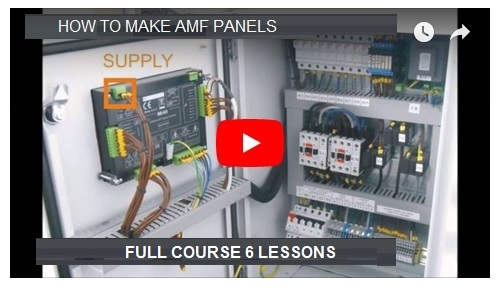 HOW TO CORRECTLY SETUP THE AMF CONTROLLER ON-SITE AND MUCH MORE. CONTROL & MONITORING TRAINING. THIS IS A MANDATORY TOOL FOR ALL PROFESSIONAL PANEL MANUFACTURERS. VIDEO CONTENTS CONTINUOUSLY UPDATED. The 5 analog inputs, can be programmed with a 6-point response curve or by a function 4-20 mA,0-5V or 0-10V. OHM / BAR 4-20mA, 0-5V, 0-10V, N.O. or N.C.
OHM / %, 4-20mA, 0-5V, 0-10V, N.O. & N.C.
OHM/ °C 4-20mA, 0-5V, 0-10V, N.O. or N.C.